The Heavy-Duty Creighton Pebbled Beverage Tub is among the highest quality beverage tubs on the market. The beautiful glazed finish creates a leak-proof and rust-resistant coating that insulates and keeps beverages ice cold for hours. Its size allows for about 30 bottles of beer or 8 bottles of wine. This item is ensured to help create successful parties for years to come! 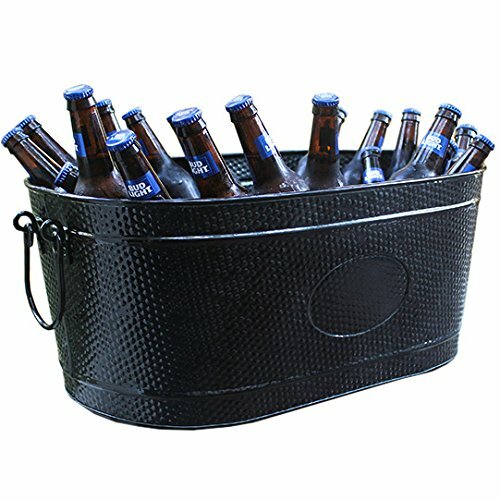 The Heavy-Duty Black Creighton Pebbled Beverage Tub is among the highest quality beverage tubs on the market. The beautiful glazed finish creates a leak-proof and rust-resistant coating that insulates and keeps beverages ice cold for hours. Its size allows for about 30 bottles of beer or 8 bottles of wine. Enjoy this product in this beautiful weather with your family and friends! This item is ensured to help create successful parties for years to come!